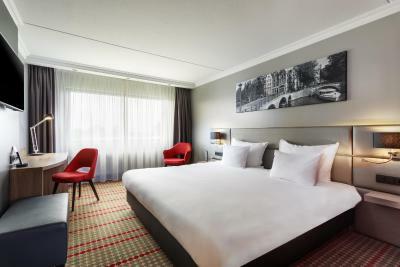 Lock in a great price for Ramada Amsterdam Airport Schiphol – rated 8.1 by recent guests! The view. The freshness. Staff polite and ready to help. Very comfy and quiet, even though we were by the elevator. We had a problem with the TV and they fixed it in a jiffy! Nice staff! The location and free shuttle to the airport were good. However, getting to the hotel from the city centre was very difficult and the reception was not very helpful. 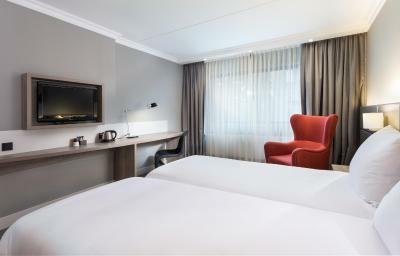 Comfortable bed, good room lighting, good airport location with shuttle service. The room was nice and big enough. 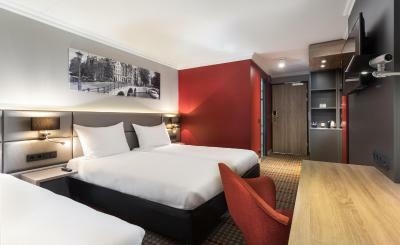 The idea was great to have a phone in room which you can use for phoning free in Europe. Staff were extremely friendly and helpful. 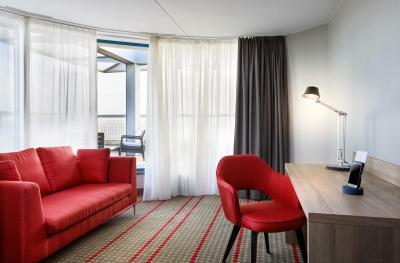 The room was clean and modern. We made a reservation on this property because we were taking our flight the next morning. We stayed one night and had an amazing time. Our room was bigger and very clean. Comfortable bed , clean bathroom and space. 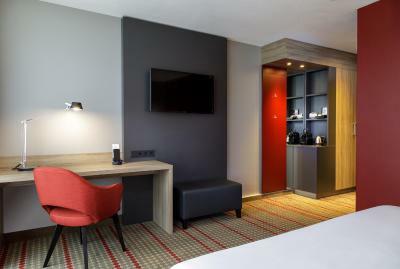 Breakfast isn’t included but you can include it while you’re reserving your room or while you’re checking in. It’s buffet but has everything you need to get your day started. Room service , and they also serve dinner. We book the shuttle to take us to The airport the next morning, and the driver showed on time. The property is 5mins with the shuttle to the airport. Friendly and nice staff. The airport shuttle was convenient, everyone was very nice. 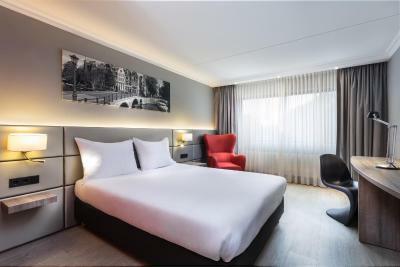 Ramada Amsterdam Airport Schiphol This rating is a reflection of how the property compares to the industry standard when it comes to price, facilities and services available. It's based on a self-evaluation by the property. Use this rating to help choose your stay! 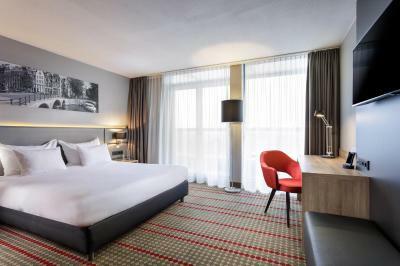 The 4-star Ramada Amsterdam Airport Schiphol features spacious accommodations with free WiFi and a wellness area including a large indoor pool area. 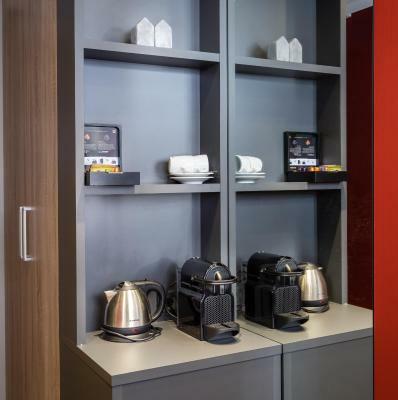 Each hotel room at Ramada Amsterdam Airport Schiphol offers a small seating corner, coffee and tea facilities and satellite TV. The private bathroom comes with free soap and shampoo products. Guests can enjoy drinks in the hotel's lobby bar "Damrak Lounge". 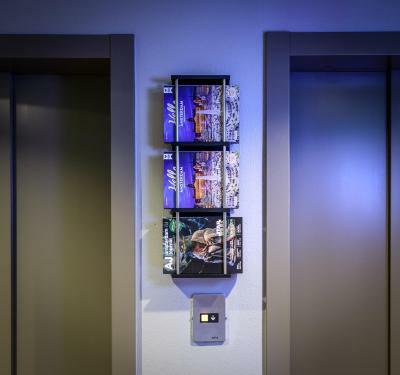 Adjacent to the hotel is a large Health Club, named Health City, where guests can make use of the fitness facilities, tennis courts and squash facilities for an admission fee. 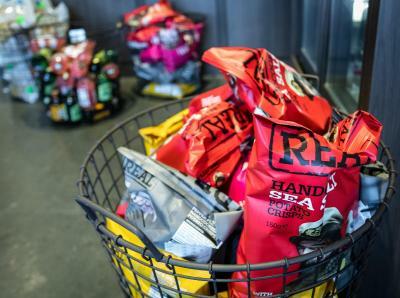 Ramada's restaurant and bar offer breakfast, lunch and dinner. Room service is available from 12:00 till 22:00. 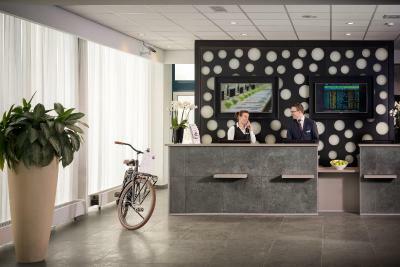 Schiphol Airport is 3.1 mi away from Ramada Amsterdam Airport Schiphol. Various trains leaving from the airport give easy access to Amsterdam center in 30 minutes and other business districts. 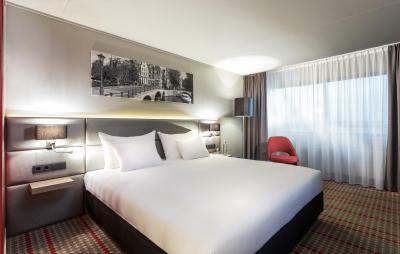 When would you like to stay at Ramada Amsterdam Airport Schiphol? 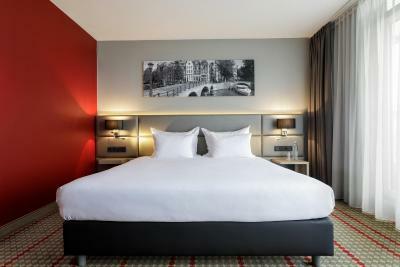 House Rules Ramada Amsterdam Airport Schiphol takes special requests – add in the next step! ATM card Debit card Ramada Amsterdam Airport Schiphol accepts these cards and reserves the right to temporarily hold an amount prior to arrival. 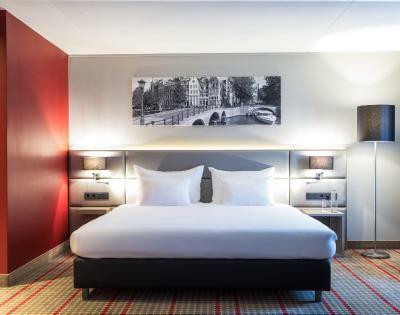 Ramada Amsterdam Airport Schiphol accepts these cards and reserves the right to temporarily hold an amount prior to arrival. The property is quite far out and the bus taking you there from the airport is unclear. The staff went out of their way to help us and the food at their Restourant was excellent. 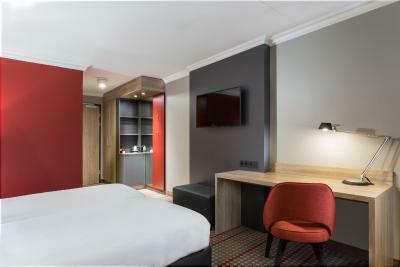 Great location, clean and comfortable Room. All amenities and staff were excellent. Surprised at how good the food was, reasonably priced too. The room is quite modest, we had no minibar in our room. I stayed here end of April and it was quite cold in our room. 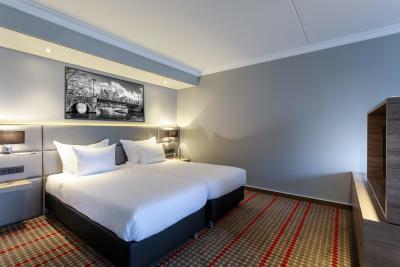 Great location for airport transfers, very close to the airport, even runs a free shuttle bus service to/from airport. Stuff is very helpful. Loved the handy phone, a local phone you can use for local calls and browsing during your stay. Bed was uncomfortable. Some staff were a bit cold! Transfer to hotel was not well arranged. Shuttle driver did not come to agreed place of pick up. We had to wait over an hour for pick up. 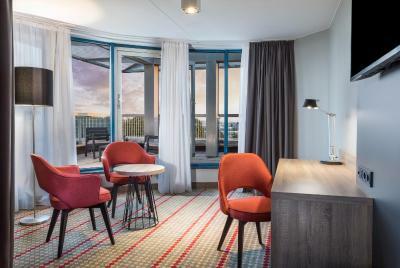 However, if you plan to spend more than one night, and visit downtown several times, do not rely on the use of the airport transfer offered by the hotel, it is only "guaranteed" for check-in and check-out, and even so you may have to wait for the next one which may delay your scheduling. You may be lucky to be able to use other times, but in my case it was usually crowded, as they use a minivan that seats about 20 people, and basically you have to go to the airport no matter your destination, since it is a hub for buses and trains. Other hotels in the region use buses for this route, so I think it may be worth staying at those. 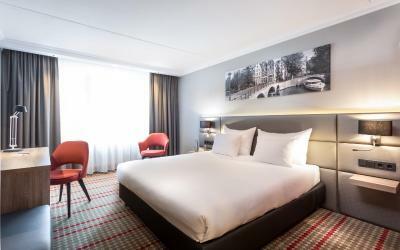 The hotel is very comfortable and the staff are courteous, with the exception of one of the drivers from the airport transfer, who was quite rude. 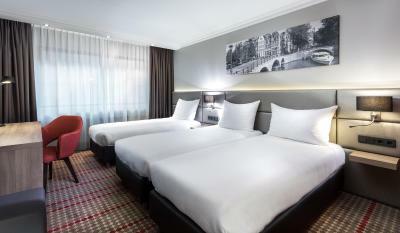 A great value for money considering Amsterdam prices.